The #MeToo movement that began in October last year in Hollywood has now spread across Korea. The #MeToo movement is a joint campaign that openly reports the widespread prevalence of sexual assault and harassment by using hashtags and social media. The #MeToo movement in Korea started in January, as the incumbent public prosecutor opened an internal communication network concerning sexual assaults or abuse in the prosecutor's office. Since then, the #MeToo movement has led to the revelation of a range of scandals concerning abuse and inappropriate or even illegal behavior in the arts, including poets, theater directors and actors, and in other sectors, too, such as education, industry and medicine. The movement is also receiving huge public support. The Media Research Center at the Korea Press Foundation (KPF) conducted a survey of 1,063 people between Feb. 19 and 22. It found that 88.6 percent of respondents supported the #MeToo movement. As to why, more than half of the respondents said that the widespread prevalence of sexual assault and harassment is a problem that must be solved any way possible. In addition, more than 70 percent of respondents said that the nature of the problems with sexual assault and harassment lie in the "power relationships," and that the most approved of measures were "to discipline the perpetrator" and "to reinforce the punishment." The government of Korea announced that it takes the #MeToo movement seriously, and on Feb. 27 arranged measures to combat sexual assault and harassment in the public sector. According to the new bill, public officials who commit sexual crimes in the public sector will be subject to a strict zero-tolerance approach. They can be subject to large monetary penalties, and can be immediately expelled from their workplace once the sentence is confirmed. Moreover, the government's Sexual Harassment and Sexual Abuse Special Report Center will be launched for a temporary period of 100 days starting in March, and a government advisory consultative group on sexual violence measures will be formed to cover step-by-step inspections at 5,000 public organizations across all levels of government. 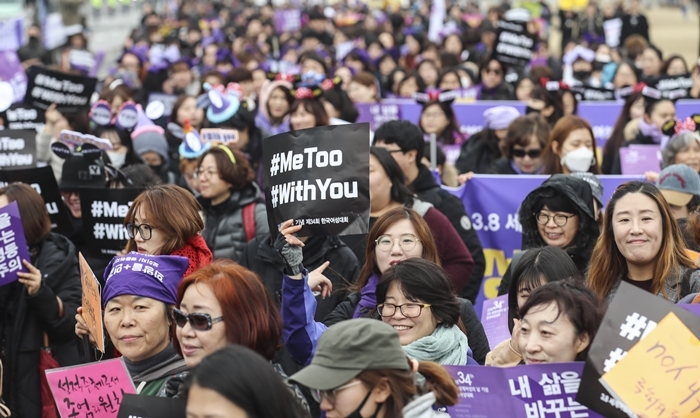 The development of the #MeToo movement in Korea is being observed with much attention, and there are hopes that it will become a positive force for awareness about gender inequality and women’s human rights issues.